We’ve heard different ways people were seemingly lead by a series of events to big lottery wins. A trip to the grocers, buying food or drinks, dreams, lucky numbers are just some of them. In Eric Rubenstein’s case it was a splitting headache which lead him to riches. 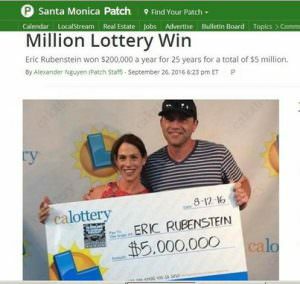 Rubenstein was on the way to another outlet after finding his usual outlet crowded when a headache caused him to stop by a CVS, where he also decided to buy a $5,000,000 Platinum Payout instant ticket. Scratching revealed he had bought a $5 million winner. The winner and his wife want to invest the bulk of the money, buy a house, start college funds for their children and donate to charity.